"Your seminar has been a must for all of our employees that interface with clients. The playback has been universally positive and the improvement in their skills has been outstanding!" "A huge success with our people! This workshop has greatly exceeded my expectations!" "Cost/Benefit Ratio is extremely high!" "Absolutely Great! It should be required for anyone who must make a presentation." "Superb! Your 5-star program has given us powerful skills, tremendous confidence, and real benefits." "Outstanding! Because of what I learned in this important workshop, my proposed annual plan for the Research Center which I presented to the executive review committee was accepted without a change in any project. Thank you, Dr. Gootnick!" Experience incredible personal growth in your presentation skills during this extraordinary workshop. 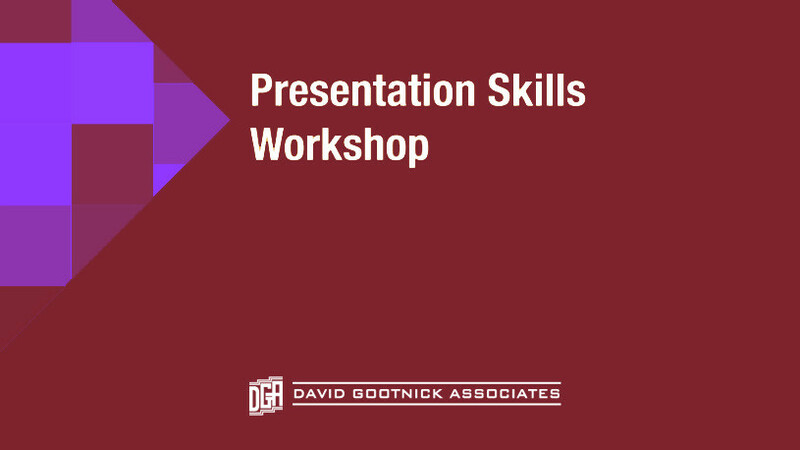 Learn to prepare exciting and persuasive technical, financial and business presentations that contribute to project, professional and career success. Experience incredible personal growth in your presentation skills by attending this extraordinary “breakthrough” training – the most powerful presentation skills workshop anywhere. As a successful professional, you have already mastered the technical aspects of your job. Now is the time to learn powerful new communication skills that will give you tremendous confidence, catapult your presentation performances, and propel you forward in your profession, business, and career. All scientists, engineers, technical professionals, and technical managers who have important presentations to give and require cutting-edge communication skills to help achieve success. Perfect for new speakers who want the most powerful presentation training available. Ideal for experienced speakers who want to hone their skills and jump to the next level. This exciting “learn-by-doing” program places you at the center of the action, with each participant building the confidence and expertise by planning, presenting, and evaluating several presentations. Each presenter receives extensive live feedback, coaching, and video analysis.